Customize your woodworking project with wood veneer edge banding. One of the easiest ways to add a touch of sophistication and personality to your woodworking project is with a wood veneer edge banding. At Sauers & Company Veneers, we offer over 25 wood species with several different backing options that will make your customization project as simple as possible. 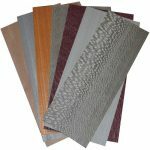 Whether you’re interested in peel-and-stick wood veneer edge banding, heat-activated iron-ons, or fleece-and-sanded automatic commercial rolls, our wood veneer edge banding is manufactured in house to ensure a seamless finish that enhances your project while minimizing the appearance of finger joints. All our available wood veneer edge banding products are designed to be easy to use for your convenience. We want to make it easier than ever for you to create beautiful projects. If you’re looking for support for your vision in the New York City area, then call us today for a customer service experience you won’t soon forget. We care about our customers, and we pride ourselves on offering professional and reliable support to artists, designers, and woodworking hobbyists. If we don’t have what you’re looking for in stock, we’ll find it and ship it to you to ensure your satisfaction every time! We will help you find the right solution to bring your vision to reality, because we appreciate the artistry that goes into every woodworking project we help bring to life. Call us today to speak with one of our experienced team members about your woodworking project, and we’ll find the perfect edge banding for you! At Sauers & Company Veneers, we create wood veneer edge banding for residents of Anaheim, Los Angeles, and San Francisco, California; Dallas, Texas; New York City; Chicago, Illinois; Boston, Massachusetts; Charlotte, North Carolina; and anywhere else in the United States.